Smart Cutlery kitchen knife is ergonomically designed to fit comfortably in hand like no other. The G10 blade and zero pressure point handle allow the act of cutting to be light, relaxed, and nearly effortless. Each piece is designed and crafted for better slicing, dicing and chopping a variety of ingredients, including fruits, vegetables, small cuts of meat. We hope the Smart Cutlery kitchen knives give everyone a chance to cook by themselves at ease. We guarantee a superior product that will give you a lifetime of exemplary service. In the event that there are defects with the workmanship or the material, we will repair or replace it free of charge to the original owner. 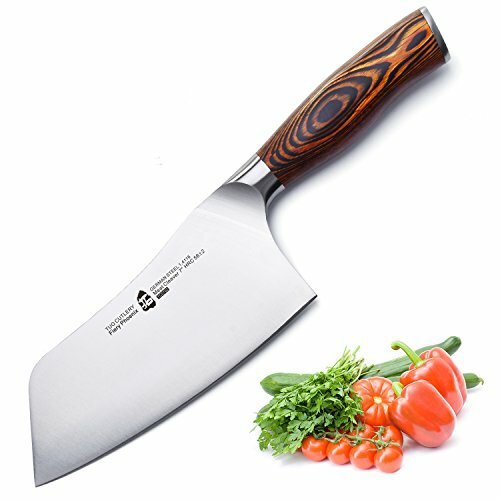 Fiery Phoenix was selected as one of the world-best kitchen knives by wiki.ezvid.com. From the striking grain of the polished pakkawood handle to the gentle curve of the blade, this is an ergonomic handle design for exceptional comfort and durability. Incredibly razor sharp, full-tang, imported high-carbon German steel with a hand polished edge at 18 degrees per side. Precisely tempered and stain resistant. Hardness reach to HRC56±2. The Pakka wood (sourced from Africa) is unique for each handle; luxurious & beautiful. A Fiery Phoenix kitchen has an international & multi-functional feel. 100% SATISFACTION OR MONEY BACK GUARANTEE, try it risk free, we know you'll love it! With the luxury packing it is also the wise choice as a gift. If you have any questions about this product by TUO Cutlery, contact us by completing and submitting the form below. If you are looking for a specif part number, please include it with your message.